The G177 is an integrated Hall effect latched sensor with output pull-high resistor driver designed for electronic commutation of brushless DC motor applications and contactless switches. The device includes an on-chip Hall voltage generator for magnetic sensing, a comparator that amplifies the Hall voltage, and a Schmitt trigger to provide switching hysteresis for noise rejection, and output driver with pull-high resistor. An internal bandgap regulator is used to provide temperature compensated supply voltage for internal circuits and allows a wide operating supply range. G177 is rated for operation over temperature range from -20 : to 100 : and voltage range from 3.5V to 28V. 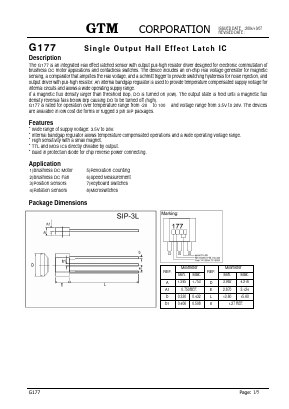 The devices are available in low cost die forms or rugged 3 pin SIP packages.